The Ardabil has a rich, exquisitely detailed and organized design in which a deep indigo field is covered with delicate, intricate floral tracery; a central medallion. The composition of the carpets is inspired by the mosque plan of Cheikh Safi, the ancestor and founder of the Safavides. The entire composition presents the illusion of a heavenly dome with lamps refelcted in a pool of water full of floating lotus blossoms. No human or animal figures appear, as befits a carpet intended for a mosque, altough they can be found on other islamic textiles used un secular contexts, both earlier or later. Completed during the rule of the Safavid Shah Tahmasp I in the mid-16th century the carpets are considered some of the best of the classical Persian school of carpet creation. 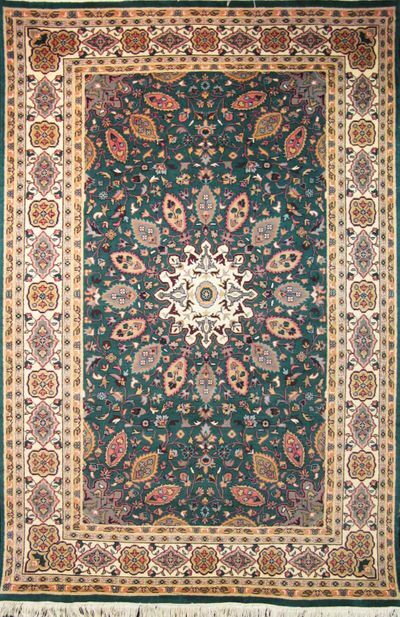 There is no record of where the carpets were made - Tabriz and Kashan are considered the most likely places - nor any proof, except for their longtime moniker, that the carpets actually came from the Shrine at Ardabil. 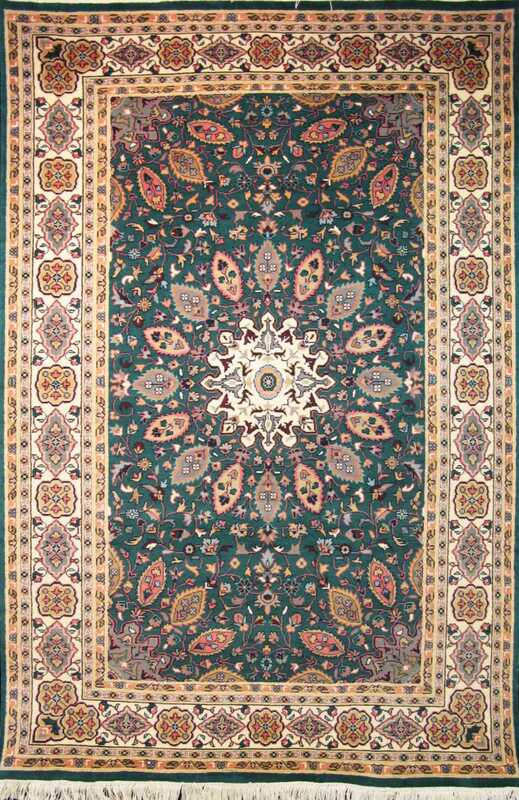 After becoming heavily worn at the mosque in Ardabil, Iran, they were sold in 1890 to a British carpet broker who restored one of the carpets using the other and then resold it to the Victoria and Albert Museum. William Morris, then an art referee for the V&A, was instrumental in the acquisition. The second "secret" carpet, smaller, now borderless, and made up from the remaining usable sections, was sold to American businessmen Clarence Mackay and was exchanged by wealthy buyers for years. Passing through the Mackay, Yerkes, and De la Mare art collections, it was eventually revealed and shown in 1931 at an exposition in London. American industrialist J. Paul Getty saw it, and bought it from Lord Duveen for approximately $70,000 several years later. Getty was approached by agents on behalf of King Farouk of Egypt who offered $250,000 so that it could be given as a wedding present. Getty later donated the carpet to the Museum of Science, History, and Art in the Exposition Park in Los Angeles. This most famous of Persian carpets has been the subject of endless copies ranging in size from small rugs to full scale carpets. There is an 'Ardabil' at 10 Downing S and Hitler had an 'Ardabil' in his office in Berlin.